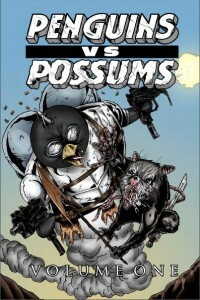 A farmer raised by prophecy to be a warrior leader, to a prodigal son trying to prove worthy of the throne, Penguins VS Possums is one of those epic fight comic books with plenty of back story to keep the story line moving. In some ways this comic book is one of those read, read again, and then read some more to make sure you get all the nuances in the story line and the art. This comic book is black and white with plenty of tones to be pleasing to the eye and the lettering is not hard to read. Overall the story line is about the eternal war between the Penguins and the Possums, with all the weaponry you could ever want including secret spy dens and religious artifacts as part of prophecy for both races. Of course humans are blissfully unaware of what is going on until a lone human stumbles into the war, and realizes the full significance of what they are seeing. Although the zoo incident is actually fairly humorous because of the obliviousness of adult humans while the kids seem to be wanting to know what is going on, and why are those critters sharing a cage and why they are just lying there not doing much of anything. Not wanting to give away too much here, in a nut shell, this is one of those comic books that leaves you on the edge of your seat turning the pages and hoping that everyone is going to make it out of this alive. Epic in scope, excellent in drawing and lettering, with a story line that keeps you on the edge of your seat cover to cover, this is a worthy comic book to pick up. Fanboy comics come along with another heroic saga that is so worth reading and enjoying. Good for the early teen to adult audience, with plenty of action, violence, and story line to keep everyone entertained. I am going to rate this one 5 of 5 stars, because everything works here, there is no down time; there is nothing that lags or is missing. Ask your local comic book store to order you a copy, or you can find it on the Fanboy comics web site right here.